About 40 million Americans are burdened by student loan debt. But before SoFi and CommonBond shook up the market, many borrowers were paying similar rates on Federal student loans. All that changed after the Great Recession when SoFi emerged as a financial innovator by offering lower interest rates on student loan refis to super-prime borrowers. Where SoFi broke ground on the West Coast early on, CommonBond soon followed on the East Coast. Quickly, a battle ensued between the two financial companies and the result has been a win for prime borrowers. Now both companies are well established with billion dollar+ valuations. 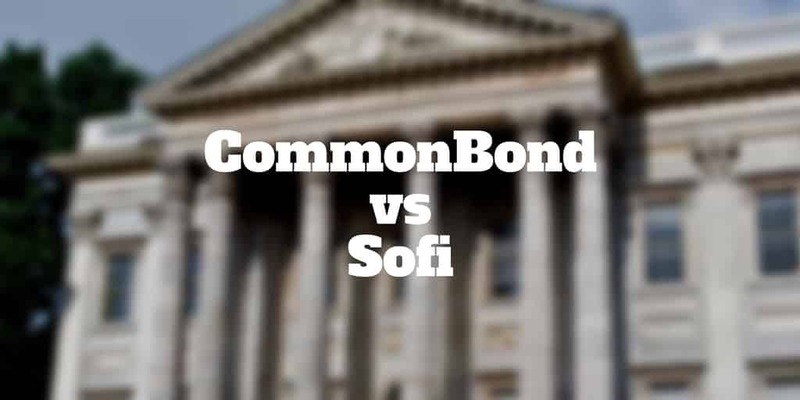 So the question arises when you compare CommonBond Vs SoFi, which student lender is best? Do You Qualify For A SoFi or CommonBond Loan? CommonBond is more narrowly focused on student loan refinancing and issuing new student loans than SoFi, which has a broader product range. But don’t let its fewer financial products deter you. CommonBond has historically kept its rates competitive, usually a smidge under those offered by SoFi. If the amount you pay monthly is your #1 criterion for selecting between SoFi vs CommonBond then the New York-based company will probably end up getting your vote. For socially-minded borrowers, CommonBond will appeal most too because each time a loan is issued, the company promises to fund the education of a child in need thanks to its partnership with Pencils for Promise, a non-profit organization. But before making a quick decision, you should know what you get at SoFi. Like CommonBond, SoFi values its community highly. When you are approved for a new loan or a student loan refinancing at SoFi, you gain access to an exclusive community of HENRYs SoFi defines HENRYs as High Earners Not Rich Yet. Think of your average Harvard, Wharton, or Stanford grad falling into this category. They have lots of potential but may not yet have realized their career ambitions yet. So, they are cash poor but the odds are they will have a rich future. You don’t have to attend an Ivy League school or a top tier University to be approved for a loan from SoFi but it doesn’t hurt. When you are approved for a loan or a refi, you will enjoy much more than competitive interest rates at SoFi. Regular in-person meetups are held whereby you can network with other like-minded community members and you may even be invited to attend talks by interesting speakers. If the idea of partnering with one financial company throughout your financial life is valuable to you, SoFi wins hands down. Beyond student loan refinancing, Parent PLUS refinancing, MBA student loans, graduate student loans, and undergraduate student loans, SoFi offers mortgages, wealth management, term life insurance, and even deposit accounts. CommonBond offers fewer products but has earned an excellent reputation delivering the products it does feature. You don’t need to break out a student loan calculator to compare SoFi vs CommonBond on interest rate costs. While both student lenders offer highly competitive rates in the marketplace, CommonBond historically comes in lower than SoFi on interest rates. On average, CommonBond claims customers save $24,046 by switching. And it’s no surprise why when you look under the hood. Not only are interest rates lower than many marketplace lenders but CommonBond won’t penalize borrowers with origination fees nor any pre-payment penalty fees. According to SoFi, you can save $290 per month on average by choosing to refinance your student loans. During our research, CommonBond came out on top when comparing interest rate charges by slightly undercutting SoFi on both variable rate student loan refis and fixed rate refis. CommonBond also provides hybrid rates that lock you in to a fixed rate for a 5-year term and then adjust to become variable rates for the subsequent 5 years. For borrowers who are paying high rates on Parent PLUS loans elsewhere, CommonBond and SoFi may be cheaper alternatives. By consolidating Federal Parent PLUS loans, you may end up paying less each month and it won’t cost you a dime in application fees nor origination fees. When you compare CommonBond v SoFi on Parent Plus Refinancing rates, the New York lender wins again with lower rates. If you have a big personal event coming up like a wedding, home improvement, home move, vacation, or simply plan to purchase an engagement ring, SoFi is your only option because CommonBond does not issue personal loans. When you choose a SoFi personal loan, or any other loan, you have a tradeoff to make. By choosing a shorter time frame to pay it off, you will pay more out-of-pocket each month. However, you will pay less in interest expenses over the life of the loan. Selecting a longer loan term will cost you less each month but will put more of a dent in your wallet over the long-term when all the interest charges are added up. To put things in perspective, here is a hypothetical table comparing the monthly payments and total payments on a $30,000 personal loan. Whether you choose CommonBond or SoFi, you can expect customer-first service and this means no stingy fees that nickel and dime you. You won’t be slapped with any pre-payment penalty fees nor any origination fees by either CommonBond or SoFi. However, SoFi will tack on a late fee when you pay more than 15 days late. At that time, the lesser of $5 or 4% of the total payment due will be charged to your account. The perks offered by CommonBond and SoFi in particular are unlike anything you might be used to in the past at big-name banks. The benefits begin with financial savings when you choose their AutoPay options. As two of the best student lenders, both companies discount interest rates by 0.125% when you choose automated payment deductions. Both companies pay you a handsome bonus to send referrals in their direction too. You can earn as much as $200 per referral at CommonBond and $300 per referral at SoFi. Beyond the financial incentives and perks, CommonBond provides a feel-good factor. When your loan is funded, CommonBond gets to work financing the education of a child in need as part of its Social Promise. SoFi has a bunch of perks but none more valuable in our view than its career support. If you find yourself out of work, SoFi will support you in finding a new role. It’s a win-win for the company because it saves them the cost of turning a delinquent loan over to a debt collector and it keeps borrowers employed and less stressed about paying off their student loans. It’s probably fair to say that most student lenders treat you as just another customer but that’s not true at SoFi and CommonBond. SoFi will invite you to join its Facebook group which is lively and active. Got a financial query? You won’t be waiting long before someone chimes in to answer it on the group thead. CommonBond too prides itself on building a community of borrowers who, on average, seem to be thrilled with its customer-first business approach. CommonBond claims that in just a few business days the entire application process can be completed but it wasn’t clear to us precisely how fast you would receive your funds. At SoFi, you can receive your funds in as soon as 7 → 10 business days. Both CommonBond and SoFi require you to refinance at least $5,000 to qualify for student loan refinancing or Parent PLUS refinancing. The most you can refinance at CommonBond is $500,000. ✅ Low Rates: Although fixed rates and variable rates are highly competitive at both lenders, CommonBond wins with slightly lower rates. ✅ Loan Types: SoFi can support you throughout your financial lifecycle from the early days when you require a student loan to when you have a nest-egg to invest via its wealth management platform. ✅ Fees: Don’t expect to pay any origination fees nor any application fees at CommonBond or SoFi. However, SoFi will charge late fees. ✅ Funding Timeline: You can complete loan applications in a few business days or less on both platforms. SoFi can issue loans in as fast as 7 days. ✅ ACH Interest Rate Deduction: Enjoy a 0.125% rate reduction when you choose automated payments at both SoFi and CommonBond. ✅ Job Support: If you lose a job, SoFi will support you in finding employment again. ✅ Social Promise: For each loan issued, CommonBond finances the education of a child in need thanks to its partnership with Pencils for Promise, a non-profit organization. ✅ Exclusive Community: SoFi has established one of the most active, supportive and exclusive communities of any financial lender. Both student lenders fare well against most other lenders on key factors like fees because neither charge origination nor application fees. And both are highly customer-focused with top notch customer support and active communities. But when you compare SoFi vs CommonBond on cost alone, CommonBond wins with slightly lower rates. It also wins the feel-good factor award by financing the education of a child in need each time a funded loan is issued. For borrowers who want more bells and whistles, SoFi is the better choice because it can support you not only when you need student loans or loan refinancing but also when you need a mortgage, term life insurance, a deposit account, or wealth management. The bottom line is price-sensitive borrowers will most likely do better at CommonBond while customers wanting to partner with a single company throughout their financial lives will be best served by choosing SoFi.